The pope is dead and the corridors of the Vatican hum with intrigue as cardinals gather to elect his successor. The result is a surprise: the new pope is the youngest of them all-a bearded Ukrainian. The Shoes of the Fisherman is the moving story of Kiril I, recently released from 17 years in Siberian labor camps and haunted by his past. 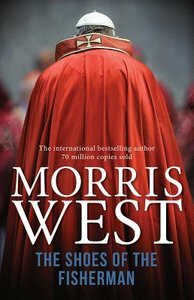 Not only is he the leader of a fractured Catholic Church, but he also finds he must confront his inquisitor and tormentor in order to avert another world war. About "The Shoes of the Fisherman"
Morris West was born in 1916 in St Kilda, Melbourne. At the age of thirteen, he left home to study with the Christian Brothers Order in Sydney, but left in 1939 after 12 years, before taking his final vows. He was fluent in Italian and French, and taught modern languages and mathematics in New South Wales and Tasmania in his twenties. He spent four years code-breaking as a cipher officer in the AIF, and then for a decade he concentrated on producing and writing radio plays. West's first novel was published in 1945 and he began writing full time in the 1950s. He went to Italy were he went undercover with Father Mario Borelli, who was working with street urchins, and wrote The Children of the Sun, published in 1957. In 1959, following six months as Vatican correspondent for The Daily Mail, he published The Devil's Advocate, which won the William Heinemann Award of the Royal Society, the National Brotherhood Award of the National Council of Christians and Jews as well as the James Tait Black Memorial Award. Shoes of a Fisherman, the first of The Papal Series, which included The Clowns of God, Lazarus and Eminence, won the Best-Sellers Paperback of the Year Award in 1965. West helped to found the Australian Society of Authors, was chairman of the National Book Council, chairman of the National Library of Australia and a fellow of the World Academy of Art and Science. He was made member of the order of Australia (MBE) in 1985 and officer of the order of Australia (AO) in 1997. Apart from writing novels, West also wrote screenplays, radio dramas, plays and was also an artist. Translated into twenty-seven languages, his works have sold more that sixty million copies. He also wrote an account on his spiritual journey, A View From the Ridge, published at the end of 1996. Morris West died while working at his desk on 9th October 1999. 030 Morris West died while working at his desk on 9th October 1999.